I love graphing so when Lindsey T showed her progress in graphs I just had to copy borrow her idea and do it too. I found some interesting results especially after I filtered out my earlier attempts at sewing. I started garment sewing shortly after I signed up for PatternReview on 4/8/07. So, it's been 20 months since I started garment sewing. In that time, I think I've come far with my skills. I have sewn 77 garments thus far this year and feel like most of them are wearable and look mostly RTW. I have also figured out which pattern companies work with my body type. 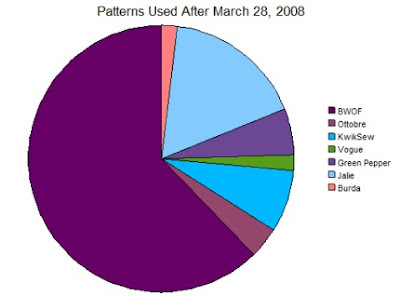 Here is a graph showing all the patterns I used for 2008. There are 12 different companies with BWOF, Jalie, and KwikSew being my favorites. If I just graph the time since I tried BWOF , you see much different results. Once I tried BWOF, I didn't buy or try any more of the Big 4. The Vogue pattern was one that I sewed earlier but then finished much later because I hated it. The Green Pepper patterns are the ones I use for my kids outerwear. When you factor those in, I use basically five companies. This shows all the different types of garments. Surprisingly, I made as many dresses as I did coats and casual tops. I did quite a bit if kid sewing which surprised me. I always feel guiltly because I'm not sewing for my kids. It's very interesting to view things this way. I'll have another entry for my goals and reflections on specific garments later on. Dinner calls. I spent the day teaching pie charts and bar graphs today, so this makes me laugh! Regardless of your charts, you're one of the most productive and skilled sewists I know. Keep up the good work! You've only been sewing for 20 months? Holy cow, I would swear you've been doing it for years. You have a natural ability Dawn. Brava! way - you've only been garment sewing for 20 months? I'd never, ever have guessed!! I didn't know you were so new to sewing either! Dang! Nice charts. 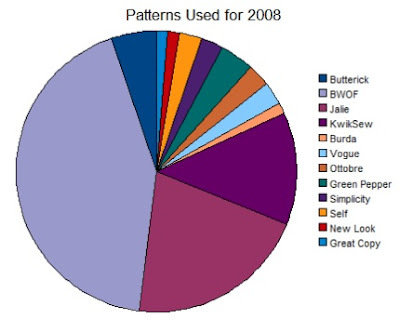 How cool to see how you've been sewing in terms of charts & graphs. I should try that and see what I come up with. I do keep track of my garments sewn and the date I sew them along with the yardage and outcome in a journal. I have logged more than 200 yds this year, but that doesn't include any "business" sewing I've done. Only 20 months huh? You're definitely a sewing natural! I am amazed that you have only been sewing such a short time. You should be very proud of yourself. You have come so far. Congratulations :)) And it just goes to show if you do keep practicing you do eventually become "perfect". Well it looks like 2008 has been an excellent year of sewing for you. You've really made some outstanding garments this year; just think of what lies ahead for 2009! Wow! I thought you had been sewing for forever! You do such beautiful work. And productivity, oh my! You definitely have the passion! 77 garments in a year is unbelievable! It's also unbelievable that you have only been sewing 20 months, obviously lots of natural talent there! Late to the party . . .
How Did I Get Him? Orange is my Favorite Color . . .